That’s a wrap folks! 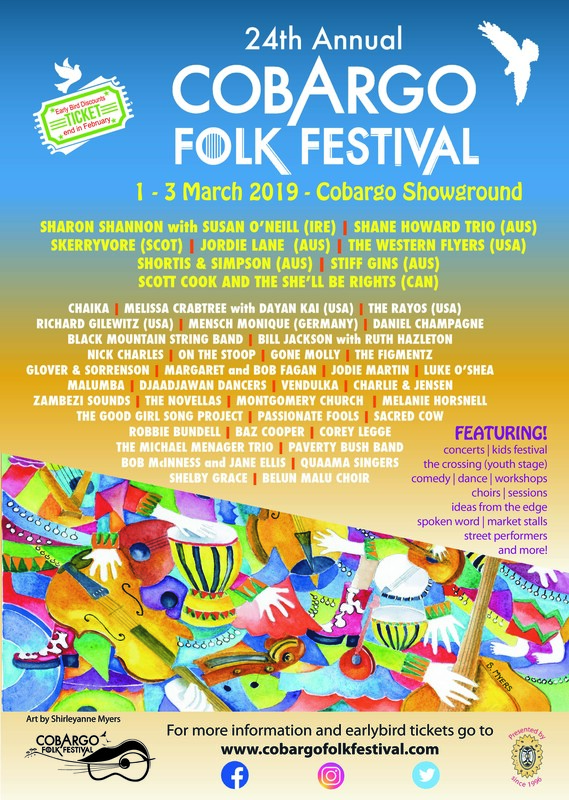 The 2019 Cobargo Folk Festival was a blast! Thanks to all our wonderful volunteers, performers, vendors, service providers and everyone in the audience who came and supported this little festival on the Far South Coast of NSW. We had a ball and look forward to doing it all again from 28 Feb-1 March 2020. See you then! 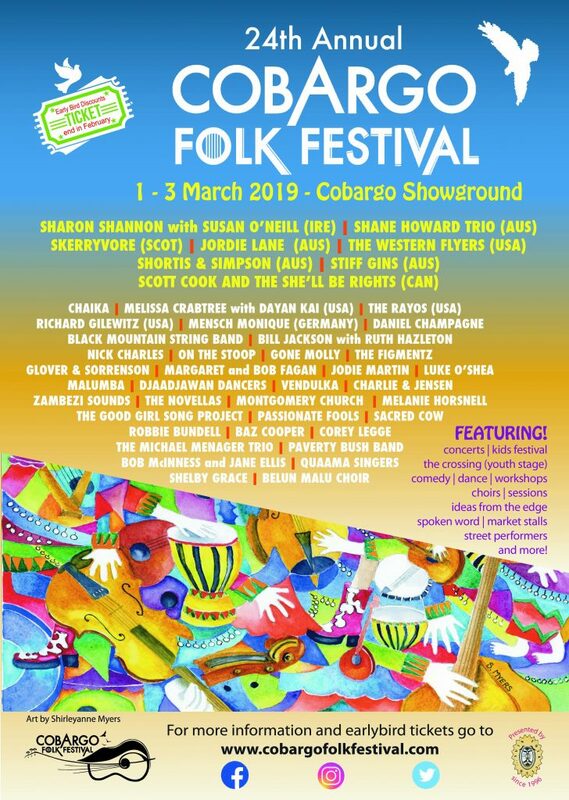 At the 2018 Cobargo Folk Festival we did something a bit different that we intend to be the start of a lasting and far reaching online archive of the music we love. We are thrilled to announce the launch of The Cobargo Sessions, a series of high quality videos showcasing a range of artists who have performed at the Cobargo Folk Festival. We want people all over Australia and around the world to see the range of extraordinary talent that makes its way to the sleepy, beautiful village of Cobargo in rural New South Wales, Australia, to entertain at our annual folk festival held in the first weekend of March, now firmly on the global folk and roots map. We also want to give back to the artists who support our festival and discovered, after talking to many performers, that the single most useful contribution would be a well-produced video. With the generous support of the NSW Government tourist promotion body, Destination NSW, we were able to engage two young film production companies, Pegleg Productions from the Albury region, and Crewcible from the ACT, to weave their magic on a pretty limited budget. As you’ll see on our Cobargo Folk Festival YouTube Channel, they did a fantastic job. We are giving each video to the artists involved free of charge, asking only that they use their own online platforms to promote themselves and our Festival. Finances permitting, we hope to grow this archive over coming years. We all learned a lot from our first year and we are have heaps of exciting ideas for the future. Obviously, we just don’t have the time or the money to do this for every performer at the Festival. So our programming team will make selections, based on availability during the festival, genres, Australian and international audience reach, and helping emerging and mid-career artists. We hope you will take time to look at this year’s excellent performances and to share them far and wide with your family and friends. Please subscribe to our Youtube channel to receive all the updates! Two fabulous Yuin Folk Club concerts are coming up in April! First up, the awesome Flats and Sharps, a high energy Cornish bluegrass/Old Timey band featuring star Candelo bass player, Robyn Martin, on Thursday 5 April from 7pm. Then we have Cara, a wonderful Celtic band based in Germany on Sunday 8 April from 4pm. Both bands are coming to us straight from the National Folk Festival. The raffle proceeds from both concerts plus a donation from the Yuin Folk Club and any other private donations from participants will go to the Mayoral Appeal Fund following the Tathra bushfires. Tickets $20 for YFC members and $25 for non-members or $30 for both concerts for members and $40 for both concerts for non-members. Concerts at the Cobargo School of Arts Hall, tix at the door. See you there! Please help us improve our next festival by completing the 2018 Festival Evaluation Survey. Please note: Visitors who purchased tickets on-line will also be sent the survey link by email. It only needs to be completed once. Thanks!